The Western Treatment Plant never ceases to thrill birders with migrants, vagrants, and rarities. 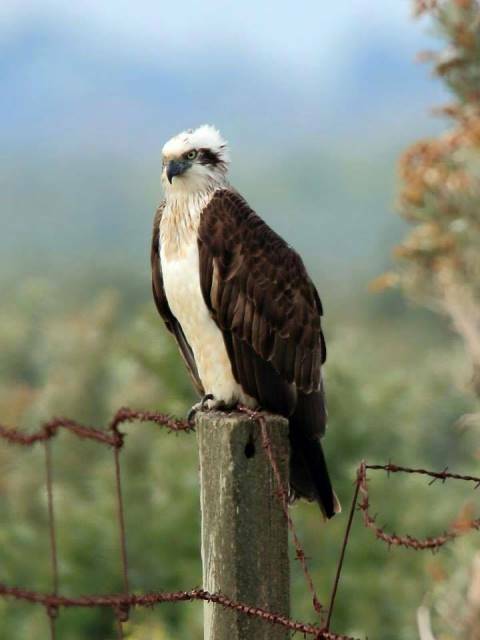 On 11 September 2015, the Victorian birding world was abuzz with the first ever report of an Eastern Osprey at ‘the Plant’, and since the birding Mecca was just a hop, skip and jump away, we were determined to try our luck. 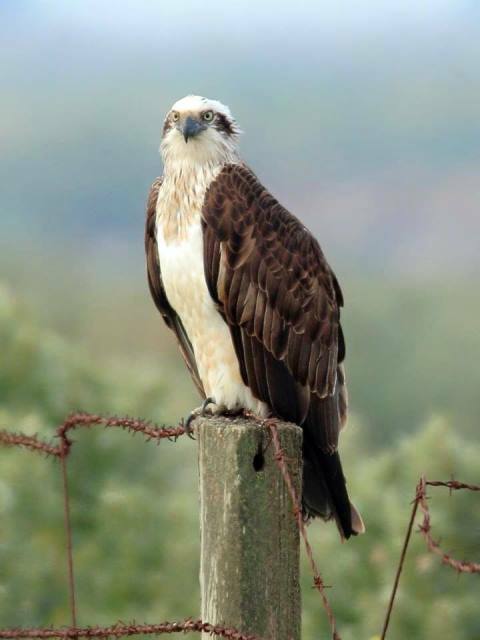 The Eastern Osprey is the second most widespread raptor in the world, (after the Peregrine Falcon) being found on all continents except Antarctica. 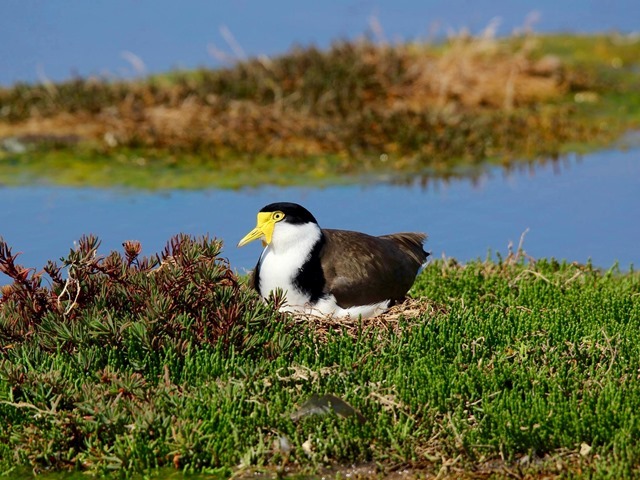 This large, fish-eating bird occasionally follows rivers inland, but it’s usually never far from the coast, whether in freezing Alaska, scorching central Africa, or humid South America. 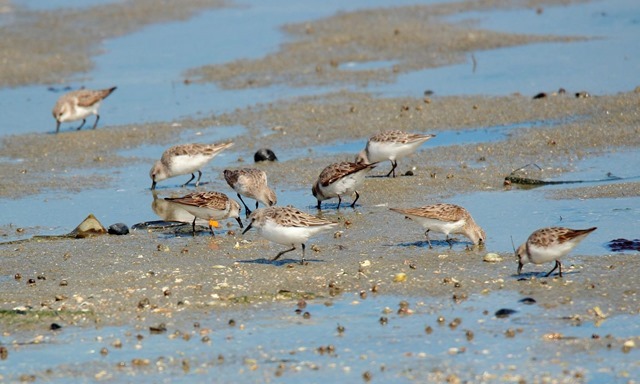 Although reported regularly in many other parts of Australia, only a handful of birds have been seen in Victoria over the last few years. 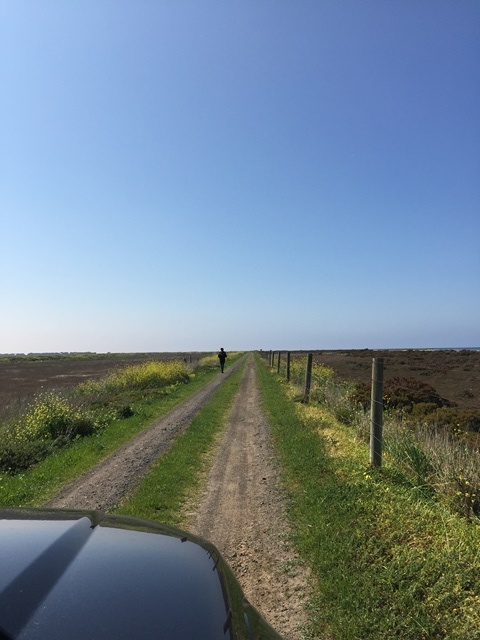 After reading about the initial sighting on Birdline Victoria, we spent the week following subsequent sightings and reading about Ospreys’ behaviour in preparation for a visit. Many sightings were through Gate 8, but we had never driven through the restricted part of ‘the Plant’ despite receiving our keys almost 5 months before, and were dreading trying to find a needle in a haystack in unfamiliar territory. Nevertheless, a visit to ‘the Plant’ is always enjoyable, so we had low expectations to find the Osprey, and instead I was more excited about seeing Banded Lapwings and Brown Quails! 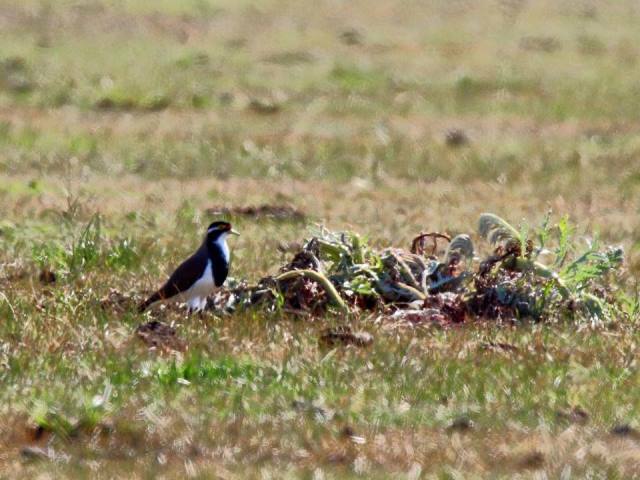 Online intel stated that the Banded Lapwings would be found in paddocks along Beach Road, and we were very pleased that our first tick for the day was a dozen of the birds, all of which were running along the floor, over and around cow pats! Unfortunately, they were so far away, and the sun was so intense, that the heat haze played havoc with our camera, and our ‘best’ photo is below. 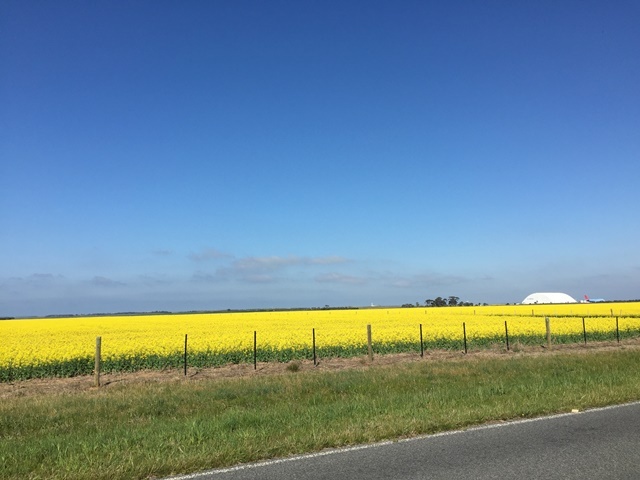 Only when we were driving off did I realise how beautiful the fields on the opposite side of the road were, with the flowering rapeseed crop. 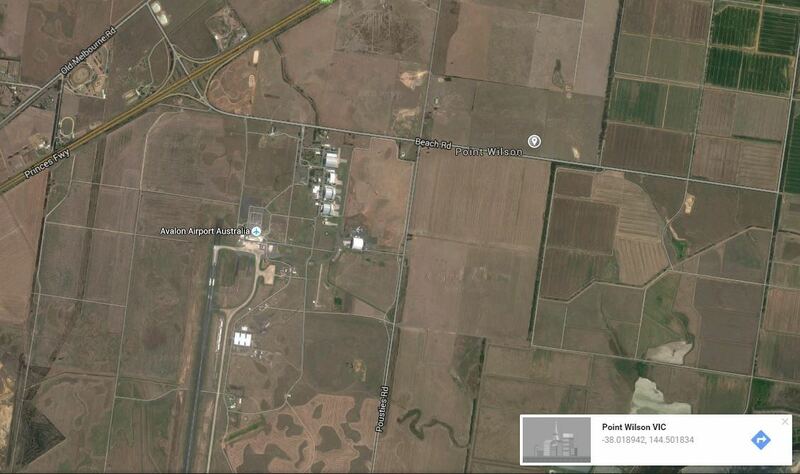 If you want an almost guaranteed sighting of the lapwings, here’s where they often are: travelling east along Beach Road, drive past Avalon Airport on your right, and start to look for birds in the paddocks on your left. Our next stop was through Gate 3, Austin Road: there isn’t a big blue ‘bird sign’ on this gate, but I was told to try my key, and the lock did indeed open! Gate 3 is supposedly a regular spot for Blue-winged Parrots, but there were none on this occasion. Instead there were dozens of cows which kept running along the fence to follow our car – when I looked into their eyes, I vowed to become vegetarian, and I did, until my steak dinner that night. One day, perhaps. We drove through Gate 2 (Western Lagoons) an saw an indeterminate raptor picking the meat off the skeleton of what was probably a snake. I’m not a fan of snakes, and froze (while driving!) when I saw a Tiger Snake slithering across the road later in the day. It was only 15C, but it was sunny, and that’s an almost guaranteed sign that snakes would be out and about – here at ‘the Plant’ if you tread on a snake, you can bet your life (no pun intended) that it’s a highly venomous species. T-Section (Gate 1) was very quiet, not in the least because access to most of this section was closed due to a nesting Brolga (which we did not see). The waders and terns obviously hadn’t arrived in very large numbers yet, since on previous visits (in summer) there were thousands of birds. We drove to Gate 5 via Point Wilson Road, and stopped for lunch near the asbestos-filled building at the intersection with the road leading to Ryan’s Swamp. I’m no fan of mesothelioma, but hundreds of Welcome Swallows were flying back and forth between puddles and the building’s eves to build their nests and it was a sight to behold, as they jostled for real estate with House Sparrows. Our lens wasn’t focusing very well and I was beginning to think that it needed servicing, so unfortunately, we didn’t get any good photos of the Swallows. Our next destination was through Gate 8: terra incognita. We suspected that the beach was the most likely location for the Osprey, so we opted for the ‘coast road’, and were rewarded with our first Whiskered Terns for the season which were bobbing up and down in the wind catching insects. We stopped at a ‘lookout’ near the 145W bridge/outlet (with the electrical (?) box and tower) because it seemed as good as any a vantage point for Osprey-hunting. Just our luck (no sarcasm this time!) 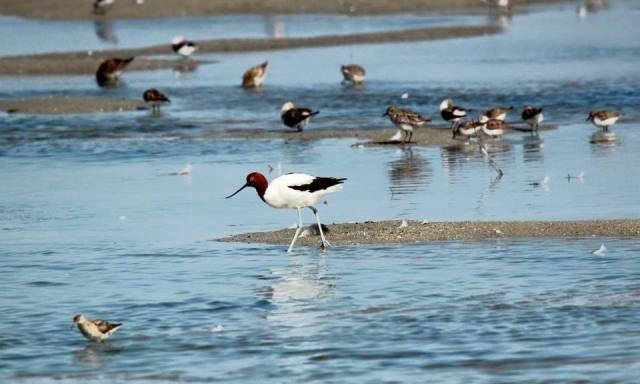 that it was an incoming tide so the hundreds of waders were being pushed closer to the shore affording excellent views of Red-necked Avocets, Sharp-tailed Sandpipers and Red-necked Stints. There probably were other species in the mix, but we aren’t good at identifying them – besides, the Osprey was our target. Imka decided to photograph the waders so I used my binoculars to scan the mudflats, and thought I spied a raptor of some sort in the mud. I called Imka over with her 600mm lens to fire off a few shots, and we both huddled over the camera’s screen with different tasks: I shielded it from the glare of the sun, and she zoomed in. “It’s a brown raptor with a white head”, she said excitedly. Success! 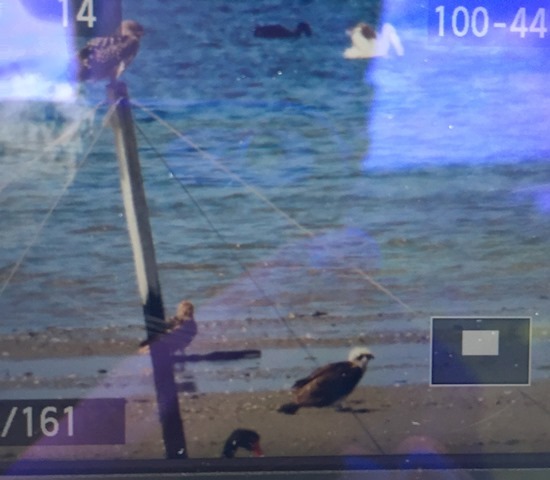 We had found the Eastern Osprey! I immediately posted the photo above to the Victorian Birders Facebook for confirmation, and the congratulatory comments flooded in while Imka snapped a few dozen more shots of a very distant Osprey. Without warning, the bird flew off towards the north east (i.e. away from us) and although we were quite pleased with the lifer, we decided to continue driving along the coast road which was heading in its direction any way. We were surprised when the road’s surface changed to a rocky seashore, and we were quite sceptical of whether the road would disappear at high tide, but decided to be adventurous and take a calculated risk. As the SAS motto goes, “Who dares, wins”, and win we did with the encounter and photograph of a lifetime. “Where’s is it?” I said. “Over there!” she said, pointing up ahead. “Ok, is it on the floor, in the bushes, on the fence, where?” I said. Imka opened her car door, hopped out, and used the top of the door to stabilise the heavy, long lens. I also jumped out, walked around the back of the car, and positioned myself behind her. And then I saw the bird! How could I have missed it? It was just 20m in front of us, looking totally nonchalant despite two goofy birders and a car nearby. We prayed to Thoth for it to stay a few minutes longer, and our prayers were answered. Imka took a few dozen shots of the bird, before handing over the camera to me to adjust some settings. Our lens was having trouble focusing all day, but for just one minute, the stars aligned, and we had the trifecta of good lighting, an obliging subject, and the right camera settings. We captured the following two stunning images of a most majestic bird. It sat there for at least 15mins, at peace, the master of its surroundings, unfazed by the sharp, rusty spikes beneath its talons or the birds of all sizes flying overhead. We were hesitant to inch forward for a better angle, lest it flew off, but he stayed for so long that we stopped taking photos and just enjoyed being in the presence of the site’s first recorded Osprey. 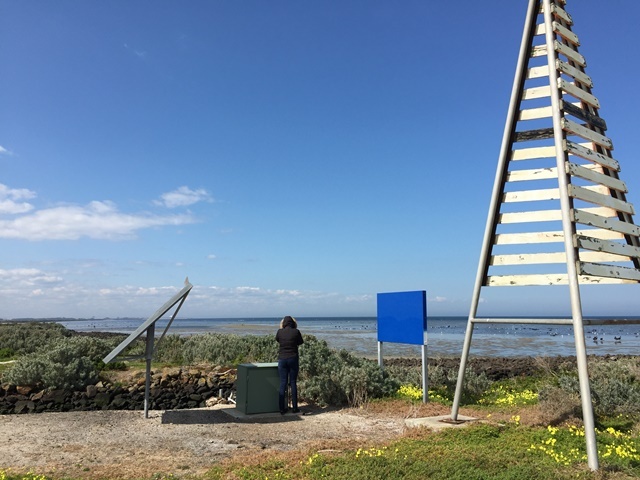 Many birders had tried unsuccessfully to find it earlier in the week and even on that morning, and here we were, two usually unlucky birders who are yet to see the common Mistletoebird, enjoying perhaps the best views that anyone had to date of the Osprey at ‘the Plant’. To say that we were elated, is an understatement. When the bird flew off, I immediately posted pics to Facebook with directions, and tagged a birder we had met earlier in the day. 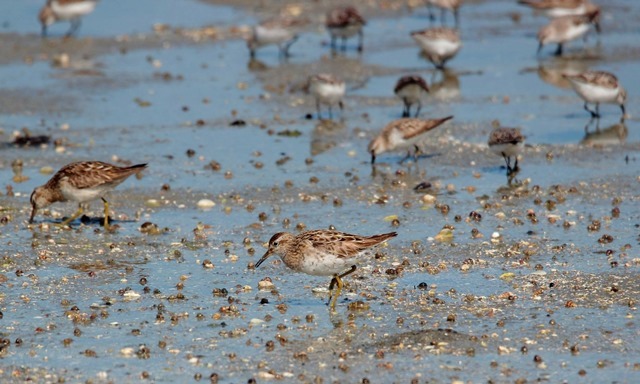 (Unfortunately, she had already left the site and didn’t see the message until many hours later, but did eventually see the bird a few weeks later – the bird stayed at the site and Avalon Beach for about a month delighting hundreds of birders.) We decided to call it a day, and proceeded out through Gate 8 and past the bird hide, with the intention of exiting through Gate 4. I knew that quails were reported here, so I approached the gate slowly, and sure enough, there were three Brown Quails just on the other side of the gate. They flew off before we could grab our cameras, but the sighing was still a fitting end to what was probably one of our most successful days of birding ever! Thanks for your kind words, Deb! Yes, it was a fantastic day out indeed. Thanks for reading and commenting, Bernie! Yes, it was a fantastic day out. Thanks for reading and commenting, James! I’m always happy to be corrected and to learn more about Victorian records. I had met an elderly birder that day who said that he was birding ‘the Plant’ for 50 (?) years and it was the first record of an Osprey he had heard of, but I suppose that real-time information was not as accessible in the 80s as it is now, so he may have missed the report. I would love to see Ospreys more often in Victoria – they are wonderful birds!